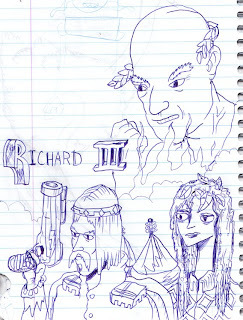 This is my rendition of what I think the play Richard III must be like, before actually reading it. Obviously, I've modernized it a little. It's like, you've got Patrick Stewart, Chuck Norris, and the Corpse Bride all in one here..
Orest, This is my favorite piece of artwork on your website. I like the details that you drew for the woman. Looks fantastic.